SMALL BOY AND HIS BIG DOG IN NEW YORK CITY, NEW YORK. A long haired and very well dressed young lad poses with his dog at the Rockwood studio in New York. The boy is wearing interesting leggings and a terrific hat. His dog appears to be a Burmese Mountain Dog but that is simply an uninformed guess. There is an unusual notation below the image; “Printed on N. P. S. extra brilliant albumen paper”. The photographer, George Rockwood of New York City was a noted celebrity photographer. It is possible that the boy featured in this image may have been a child actor. To learn more about the photographer, click on the category “Photographer: Rockwood”. 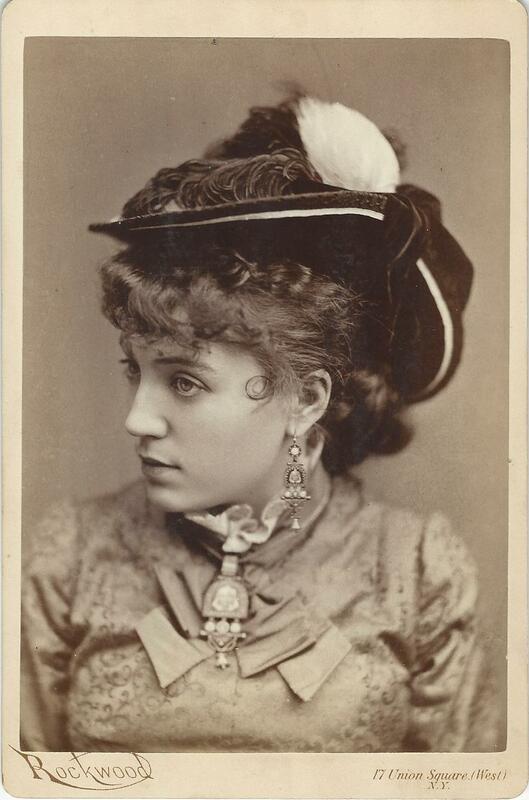 These cabinet cards feature American stage actress, Mary Anderson (1859-1940). Interestingly, Anderson’s father was an Oxford educated New Yorker who after Mary was born, moved his family to Kentucky. He then joined the Confederate army and was killed in action when Mary was just three years old. Mary was not much of a student but loved to read Shakespeare. Her step father sent her to New York at age 14 to take ten professional acting lessons. In 1875, at age 16, Mary Anderson began her stage acting career in a Kentucky production of Romeo and Juliet. She continued acting in Kentucky and then appeared in a number of other cities, including New York. Her critical reviews tended to be mixed but she was well loved by the public. She then worked the New York and touring company stages for twelve years until she spent the next six years on the English stage (appearing in a lot of Shakespeare productions). She then returned to the United States, and at age 30, collapsed on stage with a case of nervous exhaustion. This experience, likely coupled with less than favorable reviews, caused her to retire from acting. 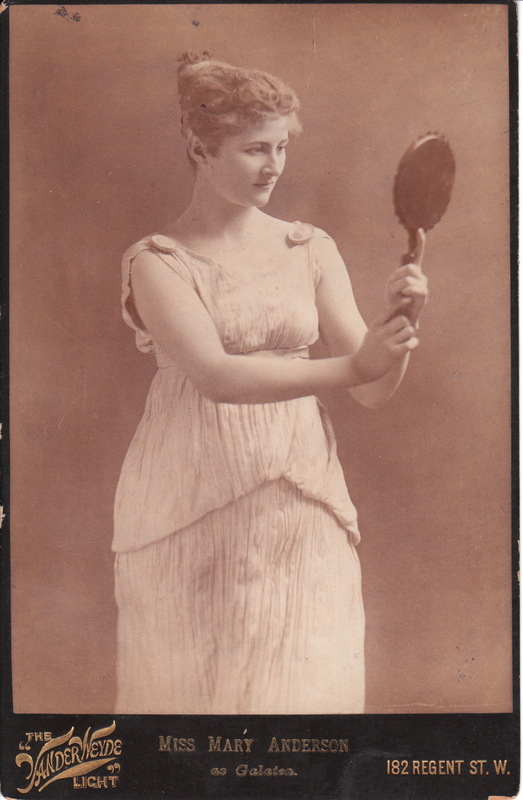 The top cabinet card features Anderson in the role of Galatea. A review of Mary Anderson’s performance in this role appeared in the New York Times in a September 1884 edition. She was appearing opposite British actor William Terriss, in the play “Pygmalion and Galatea”, at the Lyceum Theatre in London. Many notables were in attendance, including Oscar Wilde. The review states ” Miss Anderson surpassed herself and that the performance was throughly artistic and finished”. The cabinet card was photographed by The Vanderweyde Light of London, England (182 Regent Street W.). Henry Van Der Weyde (1838-1924) was an artist and photographer. In 1877, he became the first photographer to install and take photographs by electric light. The second cabinet card was photographed by celebrity photographer, Sarony. The image reflects Mary Anderson’s great beauty. To view other photographs by Sarony, click on Cabinet Card Gallery’s category “Photographer: Sarony”. The third cabinet card was photographed by “The Sparks Studio”. The studio was located in Philadelphia, Pennsylvania and the artist/manager was Elliott Houseworth. 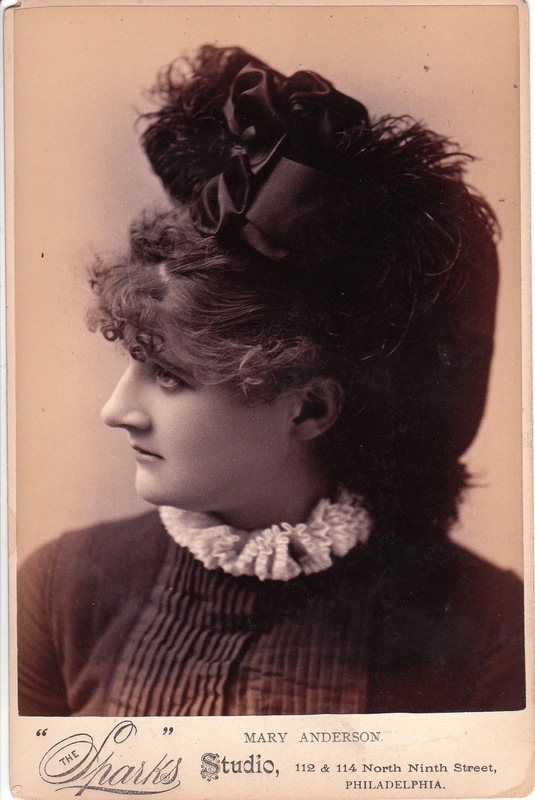 This cabinet card offers a profile portrait of the attractive Ms. Anderson. The 1880 census lists Elliott A. Houseworth as being born in 1855, residing in San Francisco, California, and working as a photographer. Houseworth also appears in the 1900 census as living in Norwood, Pennsylvania and working as a manager. These demographics fit the photographer of this image, since Houseworth managed Sparks Photography Studio and Norwood is only about eleven miles from Philadelphia. To view other photographs of actresses by Sparks, click on the category “Photographer: Sparks Photo Publishing Co.”. 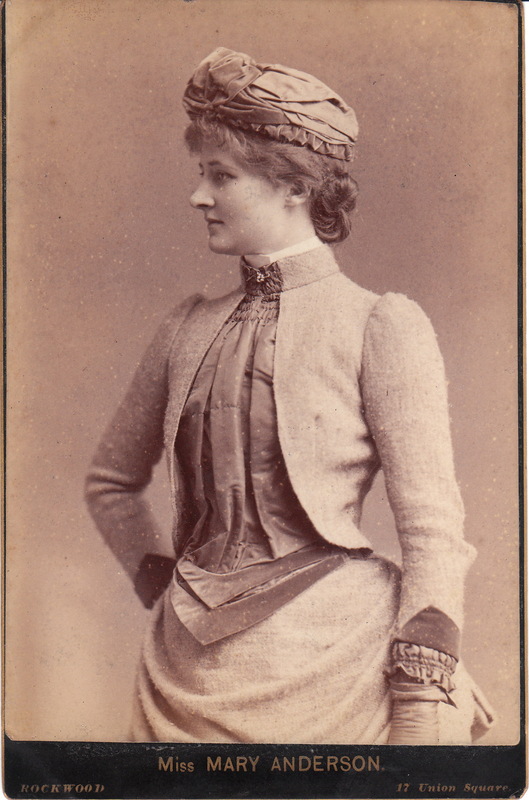 The fourth cabinet card features a smartly dressed Mary Anderson and was photographed by George Rockwood, of New York City. To learn more about Rockwood and to view more of his photographs, click on the category “Photographer: Rockwood”. A sticker on the reverse of the photograph indicates that the image was once part of the Kean Archives in Philadelphia, Pennsylvania. The Kean Archives was a company that served as a source of illustrations and photographs for various modes of media. They eventually were purchased by Getty Images. MAUD HANSON: THEATRE OR OPERA STAR OR WHO KNOWS WHAT? This cabinet card was photographed by George Rockwood (1882-1911) whose studio was located at 17 Union Square West in New York City. 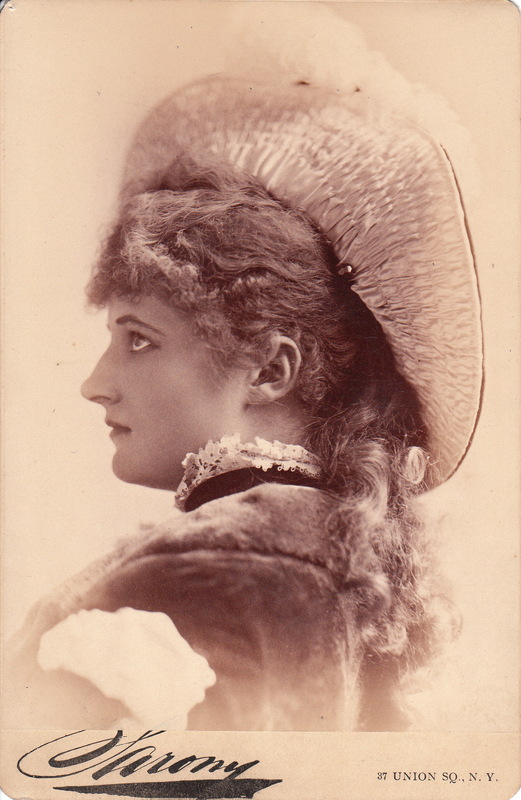 The reverse of the card identifies the subject of this portrait as Maud Hanson. It is believed that Hanson was an actress or opera star but this information has not been verified and perhaps a visitor to this site can leave a comment providing identification help. Over the years, the cabinet card gallery has appreciated the assistance of its vast unpaid research department, staffed entirely by visitors to the site. 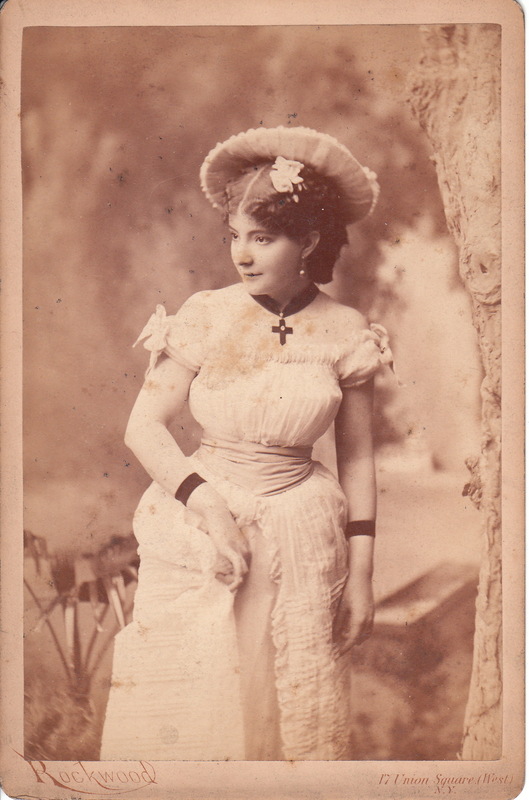 The corseted Ms Hanson is attractive and wearing a hat, a flower in her hair and a cross. She is also wearing what appears to be wrist bands. The purpose of these bands beyond fashion, is unknown. This cabinet card’s photographer, George Rockwood was born in Troy, New York. He graduated from college with a PhD; reportedly either from the University of Chicago, or Columbia University. At 21 years of age, he was a newspaper reporter for the Troy Daily Times and at age 23, he was managing editor of the Troy Daily Post. He began working as a photographer in St. Louis and in 1857 opened a studio with his brother Elihu in New York City. He is credited for bringing CDV’s to America. His obituary in the Washington Post reports that Rockwood photographed more than 350,00 people.